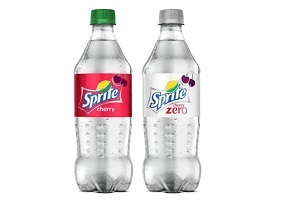 Coca Cola, the American multinational beverage company, has announced the launch of two new flavours of soft drink under the Sprite brand: Cherry and Cherry Zero. The new cherry versions of the lemon-lime soft drink are described as caffeine free and made with 100% natural flavours. The Cherry Zero variety is also described as free from calories and sugar. Both varieties will be available across the United States in 20oz bottles. Commenting on the launch, director of Sprite and citrus brands for Coca Cola North America Bobby Oliver said: “The launch of Sprite cherry and Sprite cherry zero is a great way to show our fans that we’re continuing to innovate and offering them more of the great Sprite taste they love with a twist of something new”. The new additions to the Sprite range follow previous launches including Cranberry and Tropical Mix.